Mike Wallace leaves on a cart after injuring what appears to be a serious ankle injury. 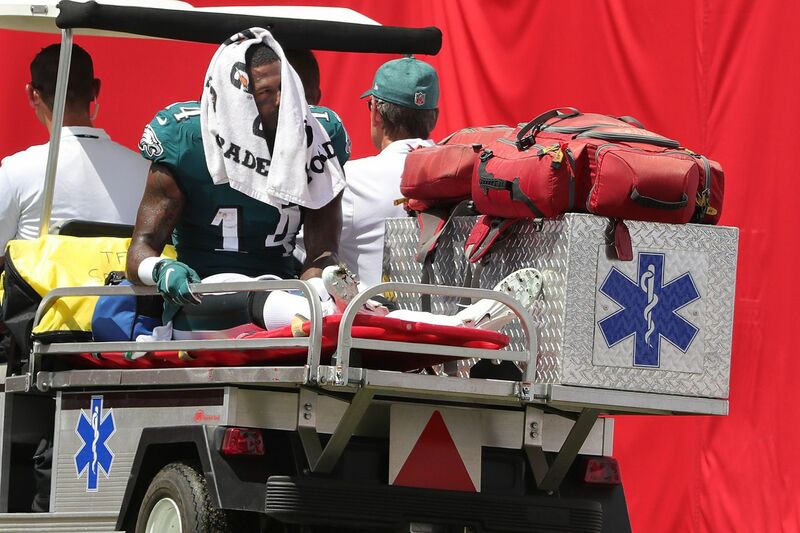 Update: Mike Wallace will miss a couple weeks after fracturing his right fibula. TAMPA, Fla. — Keeping Alshon Jeffery on the roster even though he hasn't been healthy enough to play has made the Eagles thin at wide receiver. They might have gone from thin to starving in Sunday's loss, after Mike Wallace suffered what seemed to be a serious ankle injury. Wallace, 32, was signed as a replacement for Torrey Smith, but the ball never found him much in the preseason, and he did not make a catch while playing 66 snaps in the opener. Sunday, Wallace finally seemed to make his first Eagles catch, for 8 yards, on the team's second offensive series, but the play was called back by a penalty on Jason Peters, and Wallace stayed down after being tackled. He eventually left the field on a cart and was wearing a walking boot in the locker room after the game. Eagles coach Doug Pederson said Wallace would be evaluated after the team returned to Philadelphia. If Jeffery, still recovering from offseason shoulder surgery, isn't ready to return this week, the team might need to seek help at wide receiver. Fans are interested in troubled Browns receiver Josh Gordon, who has worn out his welcome in Cleveland. It remains to be seen whether Eagles management shares their enthusiasm for a player who has spent more than two seasons suspended for substance abuse, and who then went to rehab during this year's training camp. The Eagles added former Texans wideout Braxton Miller to their practice squad last week. Joshua Perkins is on the Eagles' roster because Richard Rodgers suffered a knee injury in the preseason and eventually was placed on injured reserve. Many fans were not aware of Perkins' presence among the tight end corps, even after he got on the field for four offensive snaps in the opener, plus two on special teams. On Sunday, Perkins emerged as Doug Pederson's secret weapon, though the Tampa Bay defense seemed unfazed. Rather than throw to second-round rookie Dallas Goedert, the team's top draft choice, who looked very solid in the preseason, the Eagles targeted Perkins a half-dozen times. He made four catches for 57 yards, including a 30-yarder. Pederson talked after the game about a "chess match," and how losing wideout Mike Wallace to an ankle injury early led to more work for Perkins, who seemed to line up in the slot a lot. Goedert, who was never targeted, seemed to work mainly as an in-line tight end. Presumably, Pederson doesn't think Goedert can work as effectively out of the slot as Perkins, 25, an undrafted free agent, who played in eight games for Atlanta in 2016, catching three passes for 42 yards. Perkins said he'd never gotten the kind of opportunity Pederson gave him Sunday. "It felt good, finally getting in the flow of the offense, just getting to go out there and run around," Perkins said. "I think they just trust me because I kinda know what I'm doing out there." An illegal block penalty on Perkins negated a 43-yard Corey Clement punt return. Eagles defensive lineman Michael Bennett stayed in the locker room for the national anthem, emerging shortly afterward. There is no truth to the rumor that the team's defensive secondary stayed in the locker room through Tampa Bay's first snap. With Darren Sproles out and Jay Ajayi absent for much of the first half, the Eagles relied on Corey Clement and Wendell Smallwood more than usual in the run game. Clement finished with six carries for 30 yards and a touchdown, but his biggest contribution came as a receiver out of the backfield, with five catches on six targets for 55 yards. He also replaced Sproles as punt returner. Clement had a 43-yard return negated by a penalty. He returned two punts for 13 yards. Smallwood had seven carries for 28 yards, his most carries since October. Ajayi, who was treated for a back injury in the first half, returned in the second half and finished with seven carries for 23 yards and a touchdown. Most of those yards came on a 20-yard rush. Sproles injured his hamstring during practice on Wednesday and was ruled out for the game. If his absence continues, Clement will take on a bigger role in the passing game. Ajayi will remain the team's primary rusher.